Demand for sheep and beef farms was strong during the summer, the sector benefiting from favourable climatic conditions, plenty of feed and continuing buoyant product prices. Confidence is high, reflected in the number of less sought after North Island dairy farm listings under consideration by sheep and beef farmers contemplating decommissioning the cowsheds. 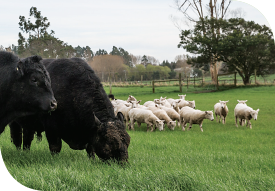 Values of established sheep and beef farms are steady, ranging from $3,000 to $4,000 per hectare for manuka properties, $6,000 to $7,000 per hectare for grazing properties at the lower end of the range, and $14,000 to $15,000 per hectare for premium level farms, although the best located properties will command more than that. Demand exceeds supply. Properties offered in the autumn should sell well. Notable summer sales include a 252 hectare Te Kuiti grazing property that sold at auction in December for $3.5 million. While the summer market for North Island dairy farms began strongly, with plenty of activity in November and December, sales then slowed. Most action before Christmas was clustered around the top-end Waikato districts, where transactions ranged from $65,000 to $95,000 per hectare, values even to slightly firm on what has prevailed previously. In most instances, however, there was only one buyer per property, rather than a multiplicity of competing purchasers. After Christmas, when those previously motivated to buy had already done so, market intensity reduced. Although there is no shortage of listings, uncertainty around the payout and the new government, and farmers concentrating on repaying debt, have held buyer enthusiasm in check. These factors should ease gradually through the autumn, though probably not in time to re-energise the market before the end of the current milking season. Buyers for Canterbury’s larger dairy farms are scarce as uncertainty around overseas investment affects value perceptions. In Southland, summer dairy farm sales were on par with the corresponding period last year, though dry climatic conditions and the Mycoplasma bovis outbreak distracted farmers from the market as summer progressed. Good recent South Island sales include a 142 hectare Thompsons Track, Mid Canterbury farm, which achieved just above $57,500 per hectare when purchased by a local dairy farmer to expand the family holdings, and a 337 hectare farm at Mokotua, Invercargill, which sold in excess of $10 million, also to a neighbour. Values for Canterbury farms sit between $52,000 and $58,000, with a premium for those with better water. Southland values remain relatively unchanged, in the early $40,000s per hectare for the upper end of the market, and from $20,000 to $30,000 per hectare at the lower end. With harvest fast approaching, this summer’s climate has been conducive to a particularly plentiful crop. Due to the periods of heavy rain in January and February, however, botrytis and disease pressure is significant. Several eight to 10 hectare vineyards are coming to the market, where they will meet excellent demand. Historically high prices mean established vineyards are ranging from $250,000 to $300,000 per canopy hectare. Demand exceeds supply for all types of viticulture property. Interest from the larger corporates is focused on bare land suitable for future expansion, while the mid-size wineries are buying smaller blocks and contracting vineyards to bolster their supply of fruit. Private individuals, meanwhile, are looking to gain a foothold in the wine industry, where the outlook is positive, and the number of people seeking to invest mirrors the same demand in the kiwifruit sector. This season’s kiwifruit property market started spectacularly in October with a series of gold kiwifruit orchards selling between $1.05 million and $1.076 million per canopy hectare. While there were no further sales at this level during the summer, that was due to the lack of listings, rather than exhaustion of demand. Existing interests in the sector, as well as other investors eager to become involved, are driving this demand for kiwifruit property. Opportunities to buy, however, are limited. Some orchards growing green kiwifruit did change hands during the summer, fetching approximately $400,000 per canopy hectare. As growers move towards harvest in the autumn, listing activity should recommence. While orchardists sustain elevated returns on investment, and with positive commentary from Zespri on the prospects for G3 gold kiwifruit, any softening of the high values at which property is transacting is unlikely. Pipfruit and stonefruit property sales were unexceptional through the summer. Demand to buy exceeds the supply of properties for sale. Although several orchardists did consider going to the market, most of these are looking to move to another property rather than exit the sector. With limited listings available and nowhere suitable for vendors to move on to, more definite activity did not therefore eventuate. Factors inhibiting the summer market, particularly among Hawke’s Bay orchardists, included the dry conditions and the changeable weather patterns. As the land greened up late in the summer, the visual appeal of orchards improved, providing encouragement for those considering listing to sell. For pipfruit, at least, owners should be more willing to sell as fruit ripens and harvest approaches. Any that decide to proceed to the market in the autumn should be met positively and can expect a satisfactory outcome. Demand for Mid Canterbury’s premier arable properties is always high. Within a tightly confined area of the district, transactions typically occur between established cropping farmers. Sales likely to be completed in late summer and early autumn look set to remain consistent with current benchmark prices for these sought-after farms, between $45,000 and $50,000 per hectare. Competition for these properties from dairy farmers, previously a feature of the sales, is not evident at present. Although the volatile weather has kept farmers on edge, heading conditions in February were favourable. Mixed spring weather, however, resulted in cereal crops between 1.0 and 1.5 tonnes per hectare below average. More arable farms will come to the market through March, April and May. While these should receive plenty of attention, the quality of their water allocation and irrigation infrastructure will determine how well they sell. Forests approaching maturity, including land and trees, are selling between $25,000 and $30,000 per hectare. After harvest, purchasers stand to net around $30,000 or more per hectare for the timber, depending on its quality. Investment interests are prepared to pay up to $4,000 per hectare for undeveloped land suitable to plant trees. Blocks of at least 200 hectares are most keenly sought after. China, Korea, India and Japan are all in line to purchase New Zealand logs, driving export prices for timber to a 12-year high. Supply and demand in forestry property is finely balanced and, when given the opportunity, investors and new buyers are enthusiastic participants, anxious to look at any suitable land offered for sale. As forestry is a long-term investment, this situation is likely to evolve through the rest of 2018, rather than altering radically.